The Colt Sauer sporting rifle was a creation by J.P. Sauer in Germany and sold by Colt in the United States and elsewhere such as Britain and Australia. 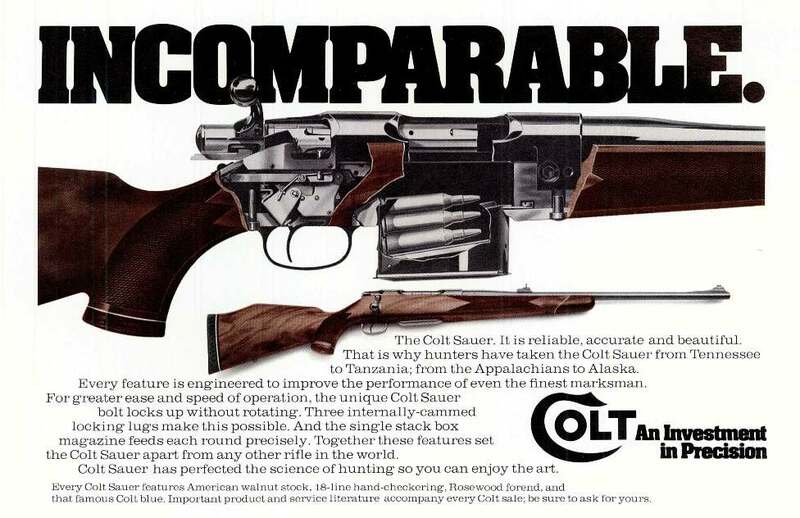 The Colt Sauer was one of a number of new bolt action designs that were intended to replace Paul Mauser’s classic Model 1898 action with something more “modern” and therefore “better”. 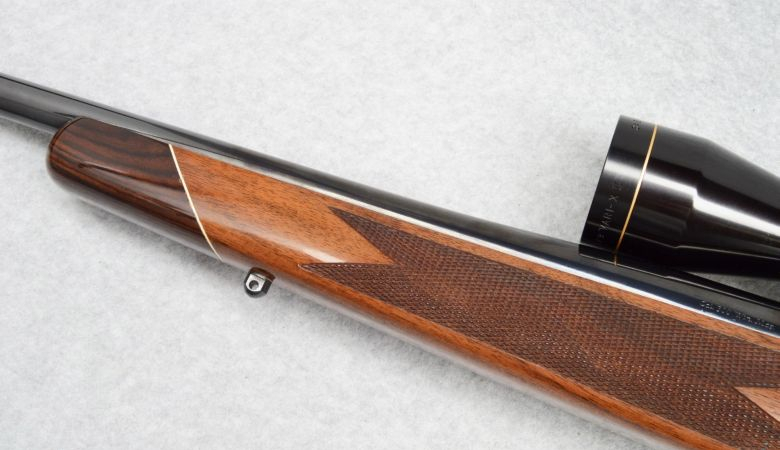 Interestingly Paul Mauser’s action is still in production as is the Winchester Model 70 controlled feed action whereas so many of the creations of the sixties and seventies have faded into obscurity, especially for makers of dangerous game rifles for whom function must take precedence over stylishness or fashion. In the Europe into which the Sauer rifle was born some of the major manufacturers were moving towards rear locking new bolt actions. Amongst these were Steyr’s new Steyr Mannlicher action found on their Steyr Mannlicher and Steyr Mannlicher Luxus rifles, Mauser’s Model 77, and the Sauer. All of them nice rifles, all of them a joy to shoot, and all of them sharing the same idea of a rear locking action, the principle difference being how the rear locking was accomplished. The Sauer rifle certainly had the most interesting bolt locking system. In the picture above if you look immediately in front of the bolt handle you will see a rectangular piece. This is one of the three bolt lugs in its retracted position. 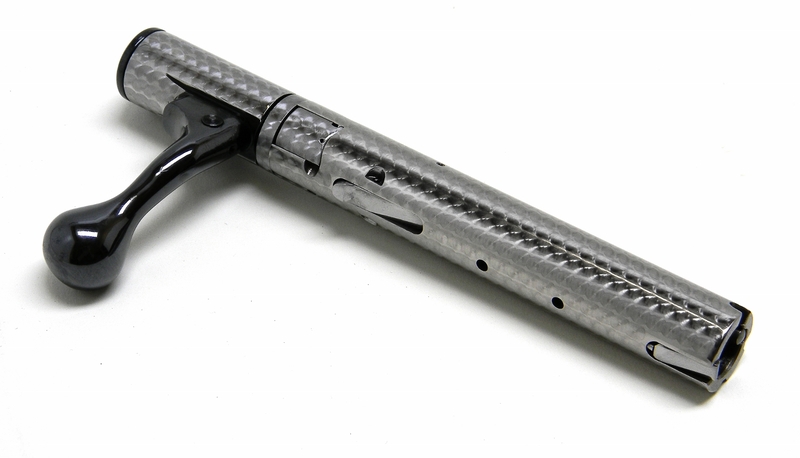 The bolt handle operates a cam inside the bolt such that when the bolt handle is turned down the cam causes the rear of the three wedge shaped locking lugs to be forced outwards into the locking recesses in the rear of the receiver. Lifting the bolt handle causes the cam to allow the locking lugs to retract enabling the bolt to be opened. It is a different system, one that works well and one that creates a very smooth bolt action with no play. As the action has three locking lugs the bolt lift is 60 degrees. This is better for clearing a low mounted telescopic sight, but reduces the amount of camming action to extract an obstinate fired case. The bolt face, as can be seen in the picture above, is of the fully recessed type with a spring loaded plunger ejector. That being the case this is not a controlled feed action. The magazine of the Sauer rifle was a single column detachable box which retains the cartridge at the shoulder. (Picture courtesy customshopinc.com). 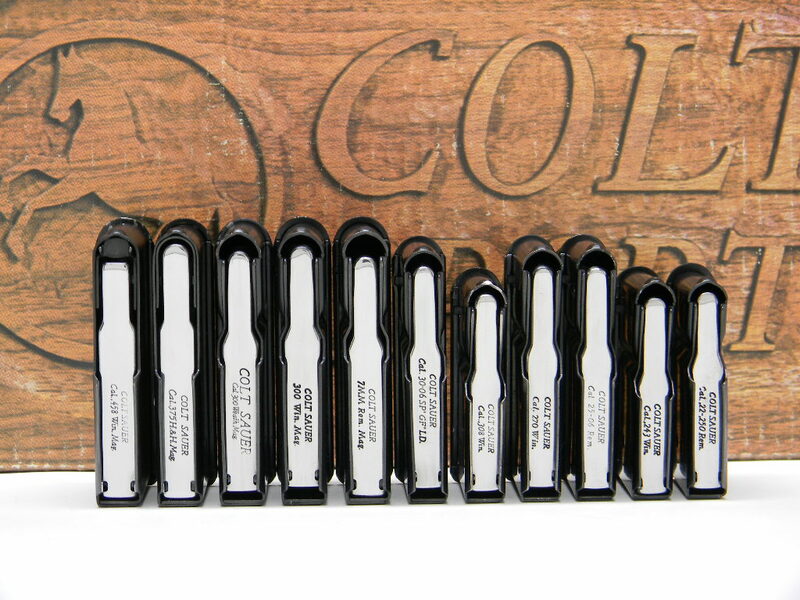 The magazines of the Sauer were a single column detachable box and were shaped to retain the cartridge at the shoulder to ensure there is no point deformation of soft pointed bullets under recoil. 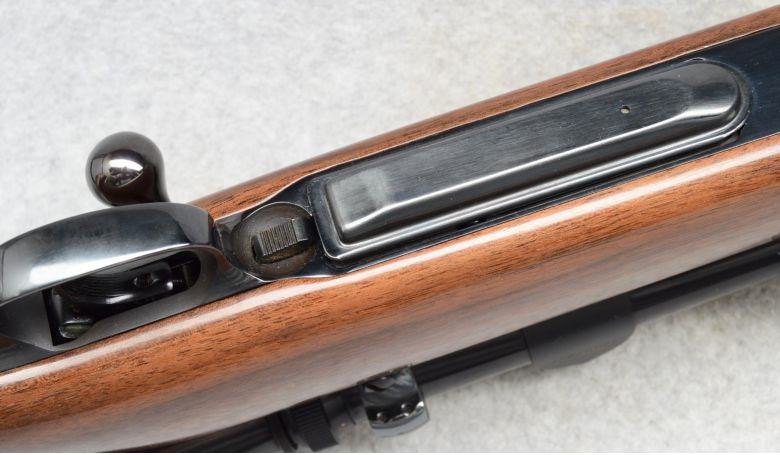 Thankfully the Sauer rifle uses steel throughout as did the Mauser 77, whereas the Steyr Mannlicher rifles of the time made extensive use of plastic for magazines and trigger guards which made them look and feel quite cheap and nasty. The beautifully made Sauer rifle is all steel and both looks and feels like the top quality item it is. (Picture courtesy Cabela’s). Colt’s version of the Sauer rifle came in three action lengths; a short action for cartridges such as the 22/250, .243 and .308 Winchester, a medium action for standard calibres such as the .270 Winchester and 30/06, and a long magnum action for the .300 Winchester Magnum, .375 Holland and Holland (the rifle being called the Grand Alaskan) and the .458 Winchester Magnum (the rifle being called the Grand African). For collectors the 22/250, .375 Holland and Holland and the .458 Winchester Magnum are rare. The Colt Sauer is a high quality rifle quite definitely in the “Porsche” class. (Picture courtesy Cabela’s). These rifles are beautifully made and beautifully designed. If we liken them to sports cars then without doubt they are a “Porsche” class rifle. 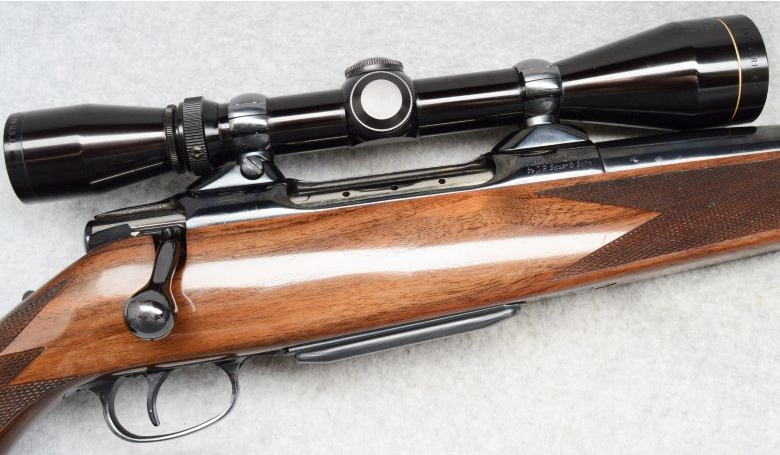 The styling of the Colt Sauer is quite unique and even led to rifle-scope mount manufacturers creating special mounts to compliment the style of the action, as our feature rifle is fitted. 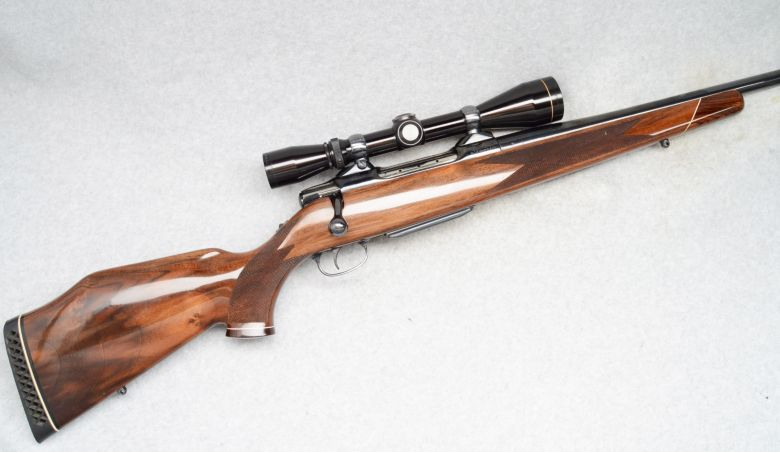 The American walnut used in the stock are typically hand selected and very pretty as our feature rifle demonstrates. 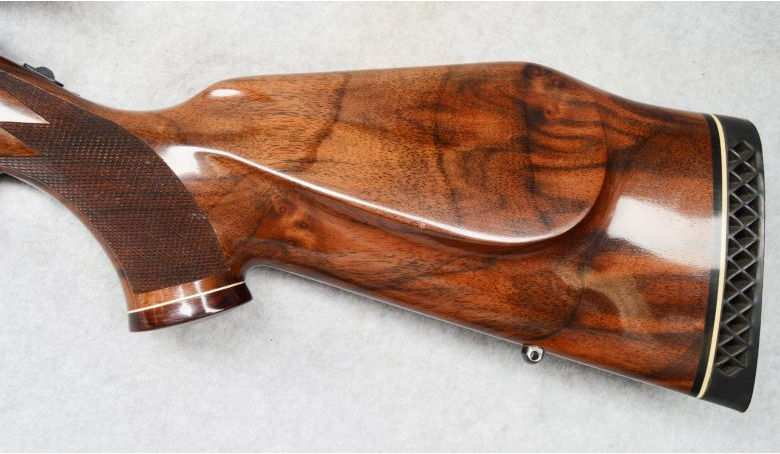 American walnut used in the Colt Sauer stocks is hand selected and finished in an American style high gloss finish. (Picture courtesy Cabela’s). Colt Sauer rifles also feature contrasting fore-end and pistol grip caps and recoil pads with white line spacers, as was fashionable in the sixties and seventies. Colt Sauer rifle stocks feature contrasting fire-end and grip caps with white line spacers. (Picture courtesy Cabela’s). This particular rifle is for sale at Cabela’s and you will find the sale page for it if you click here. The rifle has the correctly styled mounts and comes complete with a period correct Leupold rifle-scope. From the photographs it looks to be in very nice condition. For those looking for an instruction manual for the Colt Sauer rifle you will find one if you click here. You will also find a web page dedicated to the Colt Sauer if you click here. The Colt Sauer was an excellent sporting rifle and the one we are featuring in .300 Winchester Magnum would make a wonderful rifle for all manner of non-dangerous game. They are unique, aesthetically pleasing, and a delight to shoot.